1554 (4.3/d) -3547 (-9.7/d) 5784 (16/d) 20091231-18:07-GMT to 20101231-18:06-GMT (365d) Electricity consumption down ~20% on last year, generation up ~20%; now ~130%/2MWh net exporters. Actual metered imports 1051.5kWh. 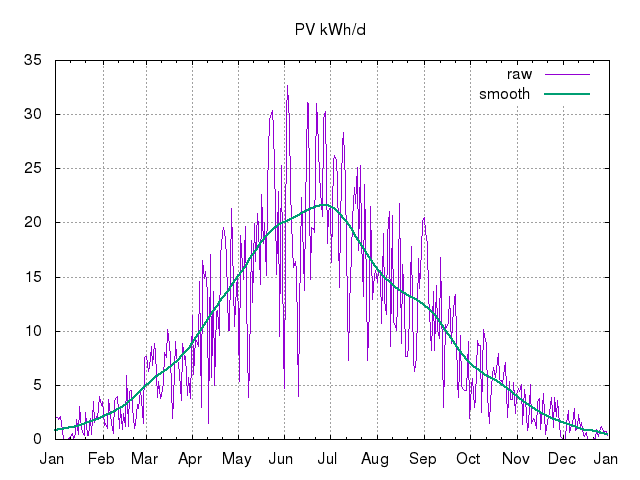 Consumption roughly bounded by 4.5kWh/d+0.2kWh/HDD12. 668kg (1.8/d) -1525kg (-4.2/d) 1099kg (3.0/d) ~0.24tCO2 (~0.66kgCO2/d) gas/electricity emissions total for 4 people, based on 0.43kgCO2/kWh for electricity (netted) and 0.19kgCO2/kWh for gas. First published 2010-01-01 , updated 2019-04-22 , rebuilt 2019-04-23 . Site copyright © 2007-2019 Damon Hart-Davis. Hosted by ExNet.